So far, 2017 has been a great year for those who own Facebook Inc (NASDAQ:FB) shares. 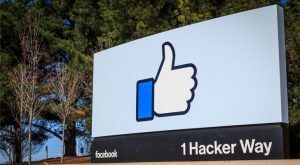 FB stock is up 56% year-to-date, making it the top-performing FAAMG stock, better than even Apple Inc. (NASDAQ:AAPL) and Amazon.com, Inc. (NASDAQ:AMZN). Some think tech stock valuations are inflated; recently investors identified “long NASDAQ” as the most crowded trade. I also think this could be a concern. There’s a lot to like about Facebook stock: high margins, fast earnings growth, and solid finances. It also benefits from the network effect, as I explained in a previous article. Social networks depend on size, and this makes unseating Facebook difficult. Snap Inc (NYSE:SNAP) seemed threatening for a while, and while teens seem to prefer Snapchat over FB, SNAP is down 42% year-to-date. As I described in March, Facebook began copying Snap’s features on its apps, including Instagram, Messenger and WhatsApp. But Facebook and its shareholders should resist the temptation to gloat. In the past, many other technology companies seemed unassailable, but then failed to anticipate the future and fumbled. International Business Machines Corp. (NYSE:IBM) dominated computing in the 1960s and 1970s but Microsoft Corporation (NASDAQ:MSFT) captured most of the value from the shift to desktops. Microsoft dominated PCs but Apple’s iOS and Android from Alphabet Inc (NASDAQ:GOOGL) won the mobile war. With more than 2 billion users and a market cap of nearly half a trillion dollars, Facebook looks mighty now. But even the biggest companies are vulnerable. How could the world’s fourth most valuable company be vulnerable? 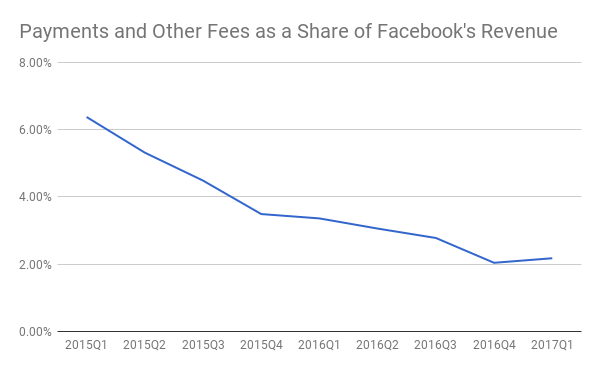 When you buy Facebook stock, you take a stake in the company’s future cash flows, namely from ad revenue. If risks to the company’s sources of income appear, investor optimism about these future cash flows will fall, along with the FB stock price. Investors are taught to diversify, and not put all of their eggs in one basket. Having all your eggs in one basket leaves you at great risk if something happens to it. Likewise, a business like Facebook should aim for a diversified revenue stream. However, this isn’t the case with today’s tech giants. Only Microsoft has really diversified. And which company is the least diversified? Facebook, which generated 97% of its 2016 revenue from advertising. And Facebook shows no signs of diversifying its revenue anytime soon. In fact, it looks like the company is becoming more dependent on advertising revenue as the share of other revenue sources shrinks. If something happens in the advertising field, Facebook could see trouble. Last year, Russian interests purchased ads on Facebook to influence the 2016 election, and the U.S. government is investigating this. 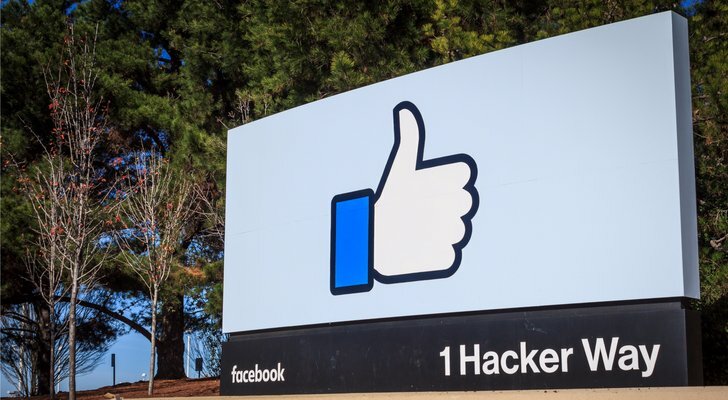 Last week, lawmakers introduced the Honest Ads Act, which will require more disclosure and transparency on political ads purchased on Facebook and other platforms. This could increase the cost of compliance for Facebook, reducing profits. Facebook needs to find sources of revenue other than advertising. Fortunately, Facebook’s dependence on ad revenue may shrink as demand for virtual reality (VR) devices increases. Facebook is a major player in this field, having acquired Oculus VR in 2014. Facebook currently sells Oculus VR headsets for around $400. In time, Oculus could account for a good share of Facebook’s revenue. 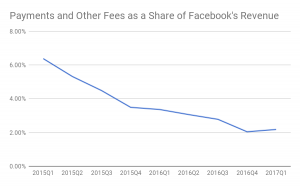 How can Facebook further diversify its revenue sources? The social network could learn from China’s Tencent Holdings Ltd (OTCMKTS:TCEHY), which derives its revenue from multiple sources. Tencent owns WeChat and QQ, two of the biggest messaging apps in the world. WeChat boasted 938 million monthly active users this year, and accounts for 30% of China’s mobile app usage. I covered Tencent’s business model in February, when I thought Facebook was moving in that direction. But in April, David Marcus, who manages Facebook Messenger, indicated that Facebook wasn’t interested in e-commerce and payments revenue. WeChat began testing ads in January 2015, and advertising currently accounts for only 18% of Tencent’s revenue. Meanwhile, 71% of Tencent’s revenue comes from gaming and value-added services, including in-app sales and subscriptions for VIP accounts with extra privileges. Facebook should diversify its revenue and could learn something from China. Article printed from InvestorPlace Media, https://investorplace.com/2017/10/facebook-inc-needs-to-address-its-biggest-weakness-before-trouble-starts/.